ACTS makes the impact it does in our community because our staff, volunteers, supporters, faith communities, businesses, and other partners have joined together. We could not do what we do alone, but together we each do our part, and it adds up to something spectacular. A year ago, I joined a brand-new organization that has taken this concept to a whole new level. It is called IMPACT Club. Founded right here in Woodbridge, it has already spread around the world, with local chapters as far away as New Zealand! The concept is simple: four times a year, individuals commit to donating $100 to a local nonprofit. Three nonprofits are then chosen at random from a pool of nominees and invited to give a five-minute presentation to the group. The club votes, and the winner takes home the entire collection. It’s simple. $100 is a nice donation to a nonprofit. One hundred people each giving $100 at the same time to a nonprofit is an IMPACT-ful $10,000 donation! I encourage you to watch this YouTube video to get a sense of the power of this group. I spoke at the very first club meeting. ACTS did not win. A wonderful charity that I had never heard of took home the cash prize. And ACTS still won, because over one hundred people learned about ACTS that night. Some have since made individual donations; some have volunteered; some have received services; and still others have spread the word in their social circles that ACTS is here to help. Just last week, Ryan Sloper and John Foster from the Club spent their day assembling eleven 14-foot shelving units for our new Hunger Prevention Center. 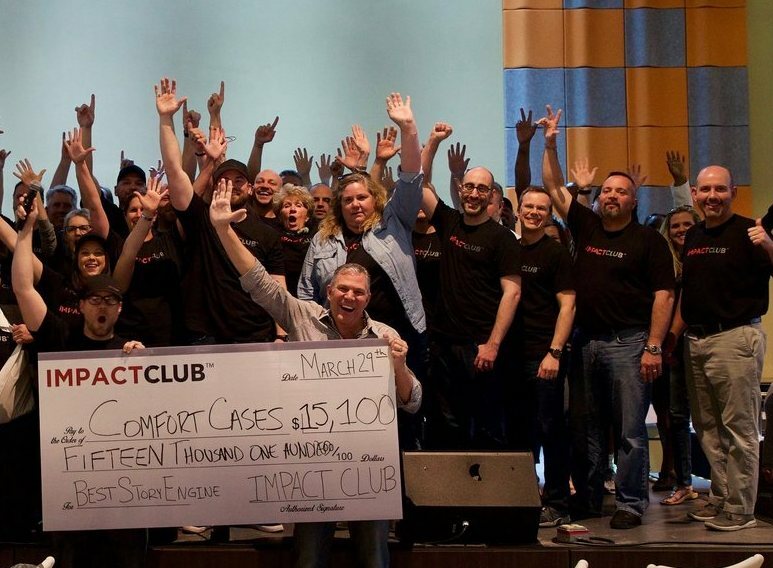 IMPACT Club brings community-minded people together. I’m not telling you to donate your money to someplace other than ACTS (my Board would not be pleased! ), but I am telling you that this is an amazing way to see your donation multiplied over one hundred-fold in one night to make an IMPACT on your community – just like your donation makes every day at ACTS. In fact, if you join the club, you can nominate ACTS to speak and give me another crack at that $10,000! Hope to see you at the next event! Steven Liga is the CEO of ACTS (Action in Community Through Service) in Prince William County, Virginia. He has over twenty years experience as a nonprofit CEO, taught at Rutgers University for eight years, and is an accomplished public speaker and consultant to other nonprofits. He works passionately to realize ACTS vision - "to create communities where no one goes without or suffers alone." Monday, 27 August 2018 Operation Turkey '18 Underway!